Two minors were charred to death when a fire engulfed their slum clusters in Madanpur Khadar area of South Delhi. The police recovered two charred bodies. They were identified as Akhtar (5) and Iqbal (7). Nine fire tenders battled for an hour before the fire was finally doused. A person was electrocuted and seven others, including a woman, sustained serious burn injuries when an 11000 volt cable snapped on LT wire in Dujana village in Dadri in the wee hours today. The government has fixed no deadline to regularise Delhi’s unauthorised colonies, a proposal it approved ahead of the municipal corporation elections here. A Delhi Police inspector has incurred the wrath of a court here for releasing an accused on bail in a non-bailable offence after detaining him for more than 24 hours. The newly elected mayor of Delhi Arti Mehra today ordered that private firms managing garbage disposal in South and West Delhi be fined Rs 10,000 each for poor upkeep of dhalaos on 13 spots in different areas. Residents of Prem Nagar area have voiced in favour of the elected councillor from the area, who along with others have been booked in a criminal case filed by the public health department for ‘causing obstructions to prevent the department from carrying out its job’. The local government hospitals and private nursing homes are flooded with patients suffering from diarrhoea. Delhi Chief Minister Sheila Dikshit today addressed problems through video conferencing raised by the residents of Saket assembly segment. This proved to be an on-the-spot redressal of grievances by application of a modern electronic technology from the office of Chief Minister. The Special Cell of Delhi Police claimed to have arrested three activists of Lashkar - e Toiba (L e T) terror outfit from the busy Dilli Haat area of South - West Delhi this late evening. Mr Akbar Khan Durrani, Chief Minister of North-West Frontier Province in Pakistan, today called on Delhi Chief Minister Sheila Dikshit in her office at the Delhi Secretariat. Mr Durrani is here in connection with a conference on Asad Madani. A key witness in a criminal case was shot dead today outside his residence in Mohammadpur Jharsa this morning. The Administrator of HUDA, Gurgaon, Mr S.P. 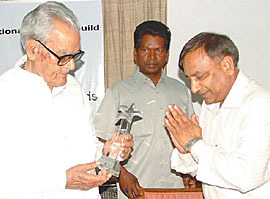 Gupta, has won the “Pradarshani Best Administrator Award” for excellence in the field of administration and management. A 1,000 bedded multi-speciality hospital proposed to be constructed in sector 43 of Gurgaon by the Haryana Urban Development Authority (HUDA) has mired in controversy as some bidders for the hospital site have alleged nepotism by the authority concerned in awarding the tender for the project. Two minors were charred to death when a fire engulfed their slum clusters in Madanpur Khadar area of South Delhi. The police recovered two charred bodies. They were identified as Akhtar (5) and Iqbal (7). Nine fire tenders battled for an hour before the fire was finally doused. At least 40 clusters, built with highly flammable polyester, were gutted in the fire, said a police officer. In another incident, a major fire broke out in a tourist hotel in Connaught Place of Central Delhi late last night in which two fire officials, including the local station fire officer Madhav Kumar Chattopadhay sustained multiple injuries during the fire fighting operation. They were immediately rushed a local hospital where their condition is stated to be out of danger. Apart from them, no one was injured in the incident. Preliminary investigations revealed that a leakage in an LPG cylinder caused an explosion that resulted in multiple explosions of rest three cylinders kept into a store type room of the hotel, said a police officer. The explosions were so loud that all fire fighters collided with walls due to loud impact resulting in their injuries. The fire in hotel Blue Star in N–block in Connaught Place area started at about 11.20 pm in night. Eleven fire tenders put out the fire in over an hour. An American couple had a miraculous escape when the roof of their hotel room developed cracked due to impact of the explosions. A person was electrocuted and seven others, including a woman, sustained serious burn injuries when an 11000 volt cable snapped on LT wire in Dujana village in Dadri in the wee hours today. The severely injured were rushed to a private hospital. The snapping of the cable had sent 11000 volt electric current to all the households in the village. The staff posted at the substation reportedly absconded after the news of the people getting electrocuted came in. The power department authorities had earlier been requested to replace the old, worn out and rotten wires, but they did not take any action. An 11000 volt lines fell on LT wire, thus sending 11000 volt current to all the houses near transformer in the village. This had fused and blasted all the electric gadgets in the village houses. As some of the villagers hurriedly switched off fans, coolers, they came in contact with live gadgets and wires. Jatinder alias Kuldip was electrocuted on the spot and seven others, including a woman, sustained burn injuries. Those charred included Omvatti, Prakash, Rahul, Sahil, Harinder, Ramveer and Mahipal. Since the villagers had no telephone number of the substation with them, they could not inform the sub station officials with the result that power supply could not be switched off. After sometime, villagers informed Dadri police station cops who disconnected the power supply on reaching the substation, Dadri. The power corporation staff posted on the sub-station absconded from their seat of duty on learning of the death of Jatinder and charring of seven other villagers. In view of the legal and administrative issues involved (in the regularisation process), no time frame had been fixed, the Union Minister of State for Urban Development, Mr Ajay Maken, told the Rajya Sabha in a reply. He said the Delhi Government had so far received 1,539 applications for regularisation of unauthorised colonies existing as on March 31, 2002. Of them, 1,432 came from societies and associations of those colonies and the rest in response to a government advertisement. Different agencies, the minister said, had been involved for on-site verification of regularisation requests. In February this year, the Union Government approved a proposal to revise guidelines for regularisation of unauthorised colonies in the National Capital Territory of Delhi. The minister, who was asked the names of colonies to be regularised, identified none in his response. Hospitals: The Delhi Development Authority (DDA) has found 22 of the 54 plots it allotted for building hospitals have no such healthcare facility in operation. Further, the land and development office had allotted land to five hospitals, out of which four were operational. One hospital, which was under renovation, had suspended its hospital facilities, Mr Maken said. Encroachment: A status quo is being maintained as per provisions of the Delhi Laws (Special Provisions) Act, 2006, with regard to jhuggi encroachments in RK Puram and Vasant Vihar, Mr Maken said in another reply. Taking strong exception to the conduct of the police officer in the case three years ago, Metropolitan Magistrate Devender Kumar Jangala asked the Deputy Commissioner of Police (West) to conduct an inquiry into the circumstances in which the Investigating Officer (IO), Inspector Om Prakash, released accused Amir Singh on bail. Singh (47), an accused in a cheating case, was released on police bail by the inspector on October 18, 2003, after being arrested the previous day. The court also asked the DCP to look into the facts as to why the accused was kept in police custody for more than 24 hours without producing him before a magistrate. It was mandatory for the investigating officer (IO) to produce the accused before a magistrate within 24 hours of his arrest but from a perusal of the records, it was clear the accused Singh was not produced before any magistrate within 24 hours, the court observed. Moreover, Singh, a resident of Nangloi in West Delhi, was released on bail in the non-bailable offence after expiry of the 24 hours, it added. It appeared that in the case, the fundamental rights granted by the Constitution and the mandatory provisions of the Criminal Procedure Code (CrPC) were violated by the investigating officer, the court noted. The matter came to light when the charge sheet in the case was filed and it was noticed Singh was enlarged by the IO himself in the non-bailable offence. The Constitution of India guaranteed the freedom of life and liberty to its citizens. The citizens had fundamental rights and no one could be deprived of his/her rights to life and liberty without the due process of law, the court said. The investigating officer had, thereby, violated Sections 56 (person arrested to be taken before a magistrate or officer-in-charge of police station) and 57 (person arrested not to be detained for more than 24 hours) of the CrPC, the magistrate said. An FIR was registered against Singh at Nangloi police station on June 30, 2003, on the complaint of one H. M. Sharma alleging that the accused had cheated him and other consumers by overcharging electricity bills. Singh was also alleged to have violated provisions of the Electricity Act under which he was authorised for supplying electricity under the single-point distribution scheme. The newly elected mayor of Delhi Arti Mehra today ordered that private firms managing garbage disposal in South and West Delhi be fined Rs 10,000 each for poor upkeep of dhalaos on 13 spots in different areas. She issued the order after making an extensive tour of South and West Delhi colonies and receiving complaints from area councillors and MLAs. The private firms, which were involved in transporting garbage from dhalao to landfill sides, were not working ‘honestly’. During the visit, the mayor found that there were huge piles of garbage at dhalaos emitting bad smell in the area. Besides, she ordered that the spots be thoroughly cleaned immediately. Mehra said that garbage should be properly disposed of in all parts of the city. She directed the Director-in-Chief (Environment Management Services) to ensure that there was no collection of garbage in streets and public places and that the dhalaos were regularly cleaned. Besides actively supervising sanitation work under her jurisdiction, Mehra urged upon all the 272 councillors to identify four new parks in their area for developing them into ornamental parks with proper landscaping, horticultural work, boundary walls, watering arrangements etc. She directed the horticulture department that at least four parks identified by the councillors should be developed as ideal parks as a contribution of newly elected councillors towards green cause. The Mayor impressed upon the need that the councillors as well as the officers should take appropriate measures to prevent water and vector-borne diseases like gastroenteritis, cholera and malaria. She said that the health department officers should involve councillors to motivate RWAs and other concerned groups. Mehra said the Councillors should make visits to MCD schools and monitor the delivery of mid-day meal services. “They should go and share the food with children to ensure that children get good quality cooked food every day as per laid down norms,” she said. She directed councillors to prepare a list of schools where repairing work was required. A large number of residents yesterday went to the office of the Deputy Commissioner, Gurgaon and clarified the councillor, Duleep Sahini, had not done anything wrong. The residents alleged that recently the district town planner had misbehaved with members of Scheduled Castes, but no action had been taken against her. Stating that in the rule of law system, every one was equal in the eyes of law, they also demanded action against the district town planner. On Tuesday, a group of women from the area visited the office of public health department and demanded cleaning up of choked sewer. The women claimed that they had been representing the case to the department for a long time. However an altercation ensued between the group and some department officials, which later turned violent. Getting the news of violence, Sahini along with other residents reached the spot. While the officials of the department have complained of being assaulted, the women claimed that the councillor arrived late when the altercation was over and he tried to work for rapprochement. The women said they had submitted a complaint petition to the police alleging that they were misbehaved by the department officials. However, they claimed that their complaint was not entertained. The ESI hospital is reported to have stopped admitting more patients. The general ward of government hospital in Sector-30, which normally has all its beds vacant, is also full these days. About 30 diarrhoea patients were admitted to government hospital in Sector-30 and the ESI hospital in last 24 hours. Another 600 diarrhoea patients were examined and advised rest at home after they were given medicines from OPDs of the hospitals. In view of higher number of patients, some beds in 150-bedded ESI hospital were having two patients on one bed. Some of the private nursing homes have also reported 100 per cent occupancy in their wards. A large number of patients are trooping into nursing homes and private hospitals also. For lack of proper checks, diarrhoea has almost assumed the form of an epidemic. Medical experts have advised using chlorine tablets in drinking water and avoiding polluted and junk food to prevent diarrhoea. But surprisingly CMO, Noida and health officer, Noida Authority, feign ignorance when asked about rise in diarrhoea cases in the town. All that the authorities could say was that private and government hospitals are not sending their weekly reports about epidemic so no remedial steps could have been taken in this connection. The Chief Minister issued suitable directions for construction of foot over bridge, community hall and parking lot as demanded by the residents of the area. Resident Welfare Association (RWA) members, the local MLA and officers were present when the Chief Minister addressed the gathering through video conferencing in the office of the Deputy Commissioner (South). 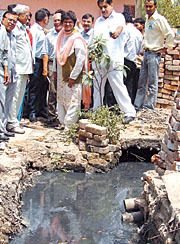 Satbir Singh, a resident, demanded construction of a foot over bridge and a community centre in the area. The area MLA, Mr Vijay Jolly, also raised his demand for construction of another foot over bridge on M. B. Road. Replying to the demands of the residents, the Chief Minister assured that DDA would be suitably requested in this regard. She informed that her government had earmarked Rs 2,800 crore for undertaking development works in unauthorised colonies which were being regularised and Sangam Vihar would also be benefitted with this scheme. Of the three arrested terrorists, two are from Kashmir and one hails from Pakistan. However, their names and other details have not yet been confirmed. Two Kg RDX, three detonators, one timer and Rs 25000 cash have been found from them, said joint commissioner of police Kanal Singh. “They were planning major attacks in the area. We had specific information regarding their movements , but we wanted to arrest them with arms and ammunitions”, he said. Following a tip- off, they were apprehended. Mr Akbar Khan Durrani, Chief Minister of North-West Frontier Province (NWFP) in Pakistan, today called on Delhi Chief Minister Sheila Dikshit in her office at the Delhi Secretariat. Mr Durrani is here in connection with a conference on Asad Madani. Expressing his pleasure over ongoing development activities in Delhi, Mr Durrani added he felt happy to see a developed face of Delhi where he had come on his first visit. He was also overwhelmed with the hospitality of the people of Delhi. NWFP is a province with a population of two crore. Mr Durrani made it clear people of both the countries were keen to have friendly relations. The police have registered a case against three persons allegedly involved in the shootout, and other three for conspiring in the crime. The accused pumped bullets into the body of deceased Kunwar Singh Bhatti when he was taking out his car from his porch at his residence. The deceased was a key witness in the alleged attempt on the lives of his brothers in court premises about a year back. The award was conferred upon him by the Vice-President of India Bhairon Singh Shekhawat at his official residence yesterday. He also gave away the Pradarshani awards to selected builders who had displayed their projects at the two-day International Real Estate Exhibition, organised at Library ground adjacent to HUDA Gymkhana Club, Sector 29, Gurgaon, from April 7.